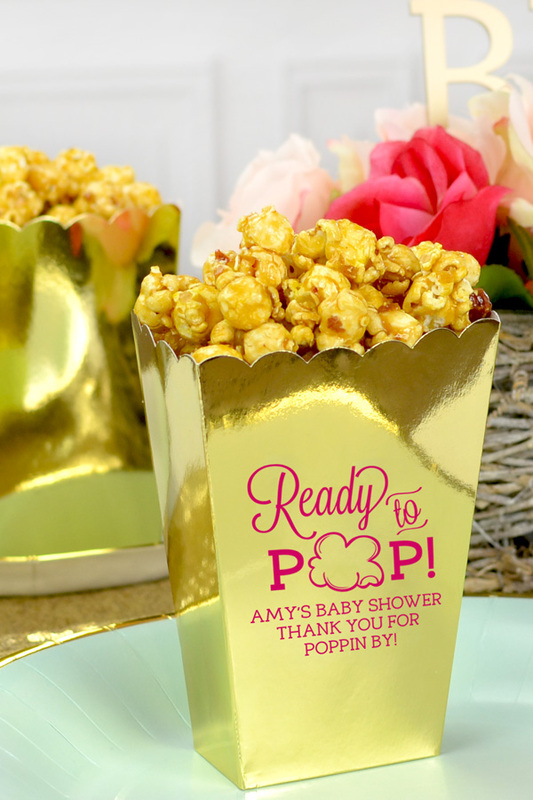 Celebrate the arrival of your new baby with these adorable custom printed miniature popcorn boxes available in 14 colors to match your baby shower theme. These small treat boxes are custom printed with a baby shower or gender reveal design and two additional lines of text. Choose from a variety of designs, imprint colors, box colors, and lettering styles to customize these favors your guests will adore. Place on your favors table for a fun take-home gift or at each place setting for guests to snack on throughout your event. Celebrate the arrival of your new baby with adorable miniature popcorn boxes custom printed with a baby shower or gender reveal design and two lines of text. Each box measures 2.5" wide x 5.25" tall x 1.5" deep. Boxes ship flat and need to be folded upon arrival.